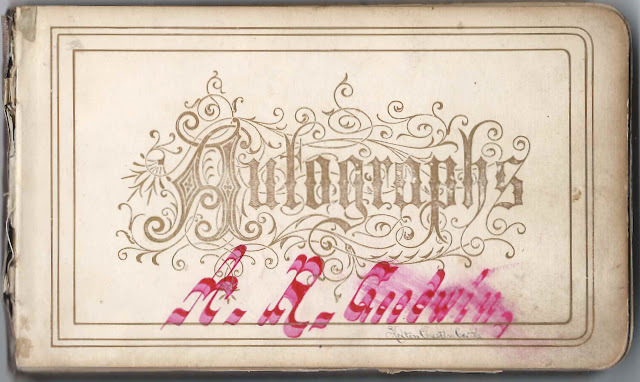 1880s autograph album of Azariah Rettenhouse Goodwin, "Ezzie", of Kelton, Pennsylvania, a student at New London Academy at New London, Pennsylvania. 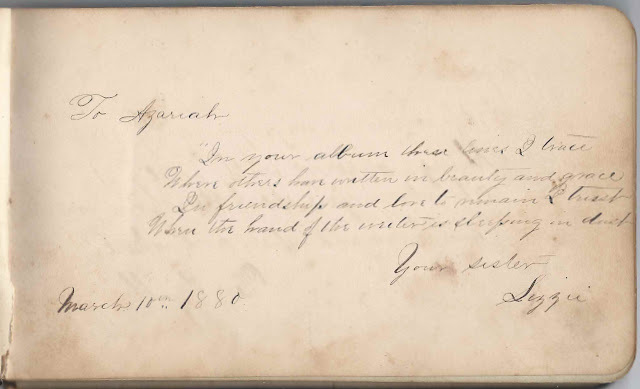 The album is approximately 6-3/4" x 4-1/4" and contains the sentiments of over 100 of Azariah's relatives, friends and schoolmates. An alphabetical list of the signers appears at the end of this post. New London Academy was originally founded in 1743 by Reverend Francis Allison, at New London, Pennsyslvania, but was moved to Newark, Delaware, where it became the foundation for Delaware College. About 1866, an academy was again founded at New London, Pennsylvania, with Reverend James Love Mackey, a former missionary to Africa, as principal. Read more about this second academy here. Interestingly, a D. Mackey signed a page in Azardiah's album. Azariah Rettenhouse Goodwin was born 16 July 1863, presumably in Chester County, Pennsylvania, the son of Jesse and Sarah Ann (Timanus) Goodwin. His paternal grandparents were Richard and Elizabeth (Heston) Goodwin. His maternal grandparents were George and Sarah Timanus. Azariah's two brothers, George and Richard, died before their first birthday. 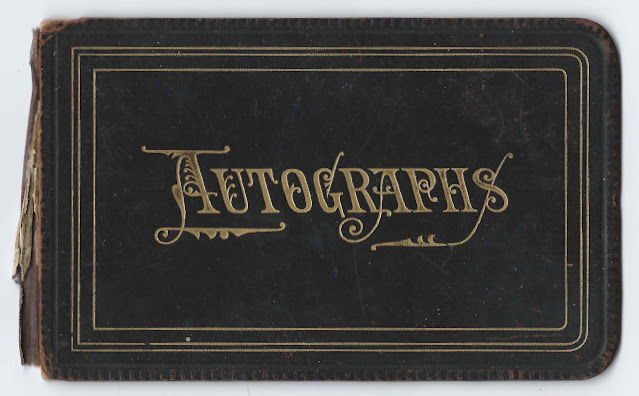 Sister Lizzie signed a page in the album on March 10, 1880. In 1895, she would marry John Wesley Dance. Sadly, Azardiah died before his time, on 10 May 1891. I couldn't find a marriage record for him. Name erased but someone wrote initials, possibly I.J.P. Written upside town by Azariah's teacher, who didn't leave a name. 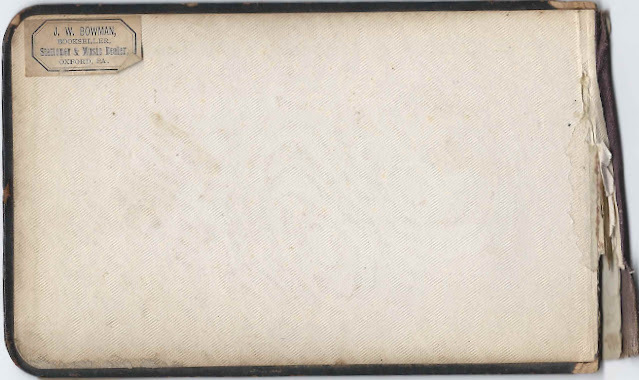 Han M. Felle, signed at New London, Pennsylvania; presumably Hannah M. Felle or Fell; it was presumably her sister, Rachel Fell, who signed another page. E. P. Hooper, signed on "3-4-1880"
Ellie Kelton of Kelton, Pennsylvania, signed on March 17, 1880 "St. Patricks day" [See a reader's comment for more information on Martha Ellen Kelton, "Ellie", (1858-1937]; the W. Kelton who inscribed a page was presumably her brother William N. Kelton [1850-1930]. 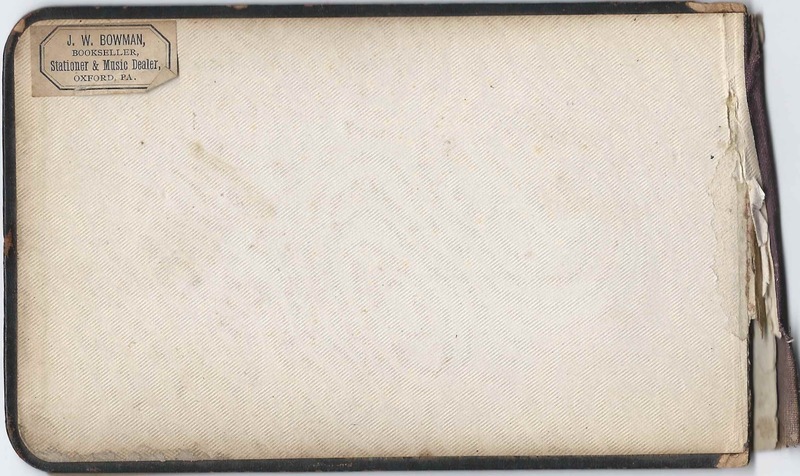 Emma Kirk of Haverford, Pennsylvania, signed on October 3, 1880; middle initial might be Z or ? Annie E. Scotten of Kemblesville, Pennsylvania, signed on "4-10-1880"
J. Hervie Sherer, signed at New London Academy, on March 3, 1881; not sure of middle name. Leander O. Smith of New London, Pennsylvania, signed at New London Academy on "third 3 1881"
Ellie Kelton was my great-grandmother, Martha Ellen Kelton (1858-1937). She married James Patton Evans (1839-1927) in 1894, adter his two previous wives died. Their only child, W. Kelton Evans (1896-1970), was my mother's father. Thanks for this additional information! I added a note to her name for the benefit of future readers. You are welcome. 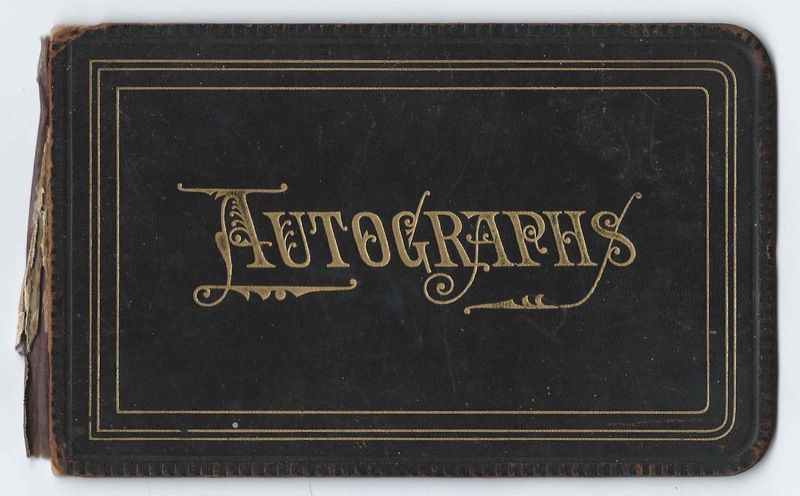 Would it be possible to scan the page with her autograph for me? Glad to oblige; sending to your email address.